A fun, friendly & laid back horse show series that is hosted at the Warkworth Fairgrounds. 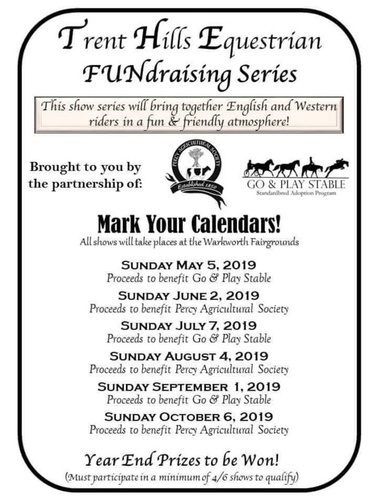 This show series is run as a joint effort from the Percy Agricultural Society and Go & Play Stable Standardbred Adoption. The 2019 series will feature 6 shows - 3 shows will focus on english-style riding classes, and 3 shows will focus on western-style riding classes. There will be a Year End Awards event held at the conclusion of the series as well, and to be eligible for Year Ends Awards, you must compete at a minimum of 4/6 of the shows.